Do not miss our podcasts! The EU-Japan Technology Transfer Helpdesk assists also European companies, universities, and research institutions in enhancing and protecting their IP in cooperation with Shiga International Patent Office through the “IPR Support Programme”. 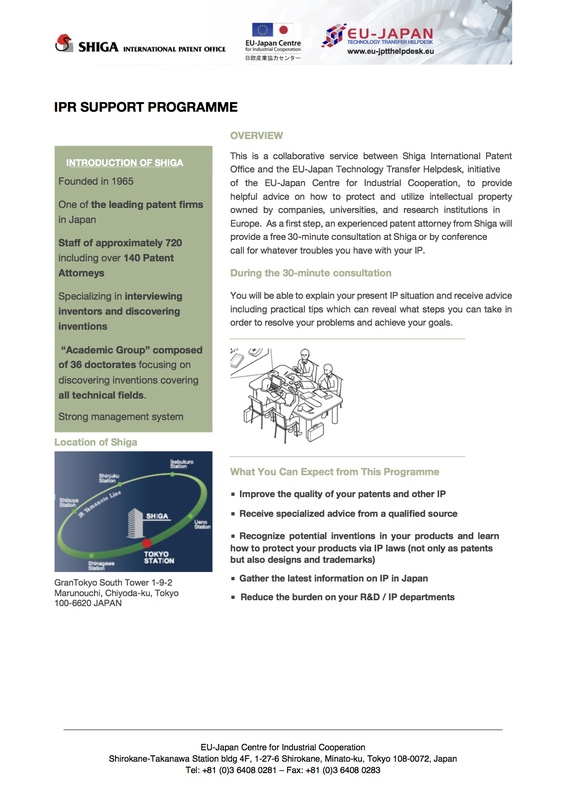 As a first step, an experienced patent attorney from Shiga will provide a free 30-minute consultation at Shiga’s offices or by conference call for whatever troubles you have with your IP. During the consultation, you will be able to talk freely with the patent attorney about your concerns including your IP goals and strategies as well as any uncertainties you might have. This programme was launched in order to provide an opportunity for companies, universities, and research institutions in Europe to gain specialized information about IP in Japan from a qualified source and to promote the protection of their IP rights in a suitable manner. For more information regarding this programme, please see the following leaflet. The EU-Japan Centre for Industrial Cooperation has become an effective bridge between European and Japanese business people and developed a valuable policy analysis capacity on industrial and other public policies having an impact on business in the EU and Japan.